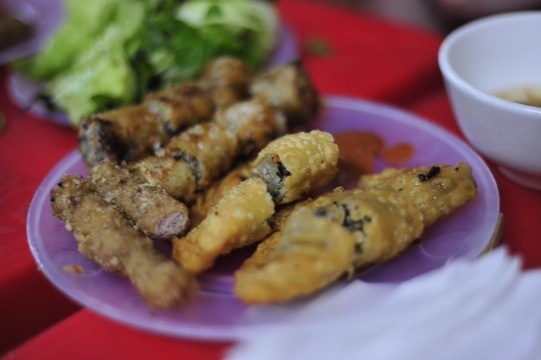 If you are a foodie like me and Betty than definitely go on the Hanoi Street Food Tour (http://www.hanoistreetfoodtour.com) We had two guides, Phuoc and Linh, and we were part of a group of 9. We visited a total of 10 places, 8 food and 2 drink spots. We went through the Old Quarter which is where all the best food seems to reside and right they were. Because Hanoi traffic is so crazy I made sure not to walk and take pictures upon risk of being hit by a motorbike or car. 🙂 Our guide, Phuoc had a great way of keeping us all together by referring to us as “Sticky Rice,” so that we would remain close especially when crossing streets. Off we went on our tour and I’ll just write about our favorite dishes. Despite the number of places we visited all the portions were just right. 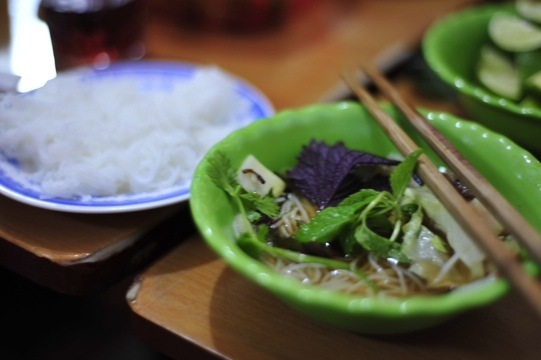 We started off with a delicious noodle soup called Bun Cha – it’s comprised of noodles of course, fresh veggies and pork. So flavorful and it’s something you should add fresh mint to and of course some hot sauce. Next up was some dessert. 🙂 We had seen a line earlier at this place when walking around Hoan Kiem Lake and turns out it was one of our stops. 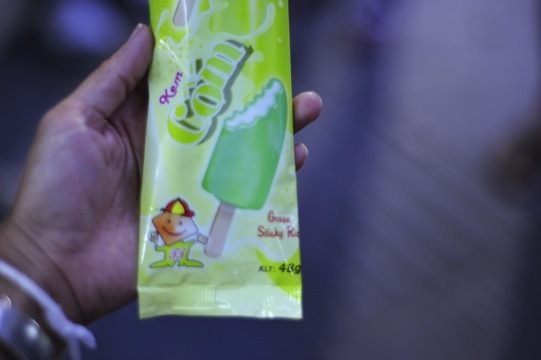 The ice cream company’s name is Thuy Ta Kem and they make an ice cream called Sticky Green Rice. It might sound weird but it’s really sweet and tasty. Next was something like a spring roll but the wrap wasn’t fried. It’s made of rice and the contents inside was chopped up mushroom. The garnish on top was like fried onions. They called this Bahn Coun. This was my favorite dipped in a bit of fish sauce and chili sauce. Ono! We then visited a place that just made spring rolls and what they called pillow cakes, which were kind of like empenadas. We enjoyed the last few stops at that were just drinks. Hanoi’s Old Quarter literally has streets that just sell specific things like a shoe street, fish sauce street and in the evening there is a place called Bia Alley (Beer Alley) This place was packed and people were spilling onto the street even with traffic passing through. Our group literally sat in the street while having a glass of Bia Hoi. By day the place we had our beer is a photolab – ha! We ended the night with some coffee or technically it’s egg coffee. It’s coffee mixed with an egg custard which when first described to us, they said it’s coffee mixed with egg and we all made this funny face and adverse reaction. LOL but when it arrived it was one of the most delicious cups of coffee I had and I’m not a coffee drinker. They also make egg chocolate which is equally good. The next day we walked around the French Quarter which has much wider streets and traffic isn’t nearly as busy. 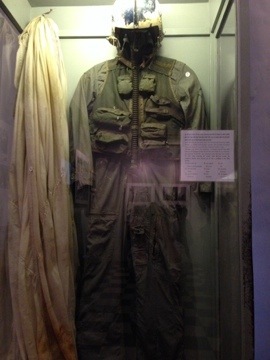 Nearby is where the Hoa Lo Prison is, the place where many US Pilots that were shot down during the Vietnam War were kept including John McCain. It’s usually referred to as the Hanoi Hilton. 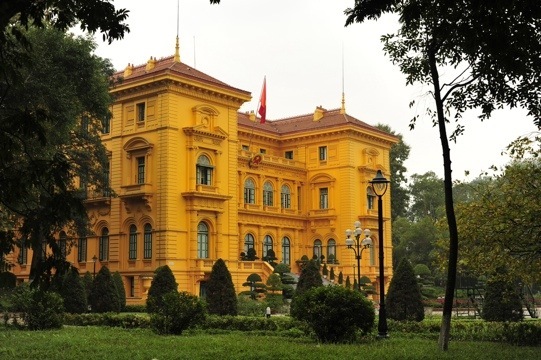 They’ve kept part of it as a museum and the other part are now the Hanoi Towers. 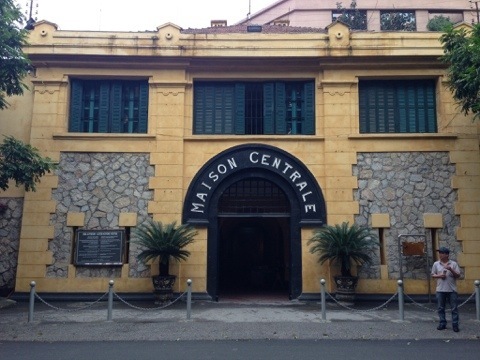 It was an interesting walkthrough and the prison was used by the French in Vietnam for political prisoners. 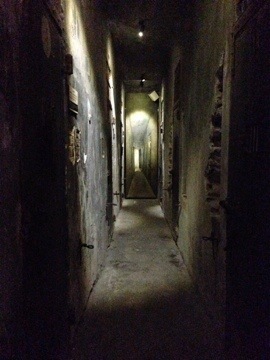 There were definitely parts that were a bit eerie to go through. After our walk through we then met our tour guides Rose and Duc from Hanoi Kids (www.hanoikids.org) This is a great organization of kids that want to practice their English. 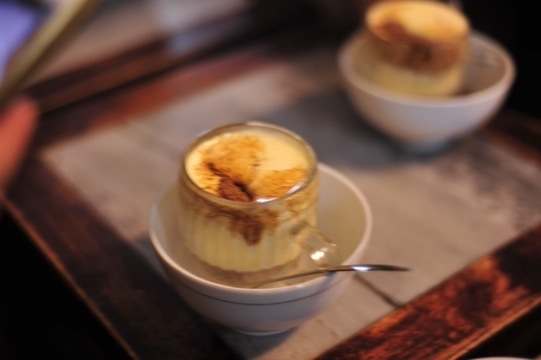 There are fixed itineraries but you can also modify it per your wants and tastes. We did a half day but the kids say that if they are having fun they usually go longer and we had a great time with them both. Also the only costs you have to incur are any transportation or entrance fees for places you visit, along with taking care of meals should that be something you decide to do as well. 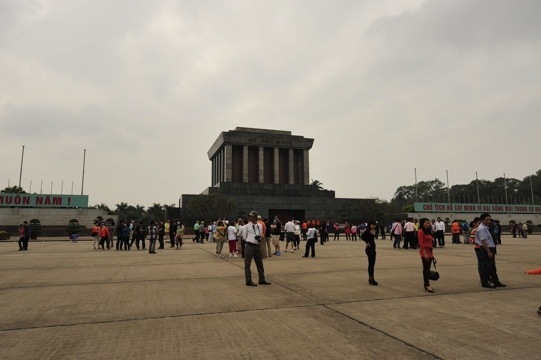 We started off our tour at the Ho Chi Minh Mausoleum Complex. This is a very holy place for the Vietnamese as this is the final resting place of Ho Chi Minh. The actual building that holds his body was closed at the time but the complex itself is massive. He was the liberator of the Vietnamese people from colonialism and is often referred to as Uncle Ho. It’s quite impressive. Behind the mausoleum is the Presidential Palace and also his stilt house that is beautifully made. He was a modest man that lived very simply for having such a great role. After we toured the complex, Betty and I were pretty hungry so we asked Duc and Rose for a great place to eat. They took us to a restaurant called New Day and we enjoyed a great meal and conversation. Along with discovering that there is something called egg beer, which many of you saw pics of me on FB. We had a fun time with them and I would highly suggest doing a tour with Hanoi Kids whenever you visit here. The next morning we were off to Bai Tu Long Bay which is a little further north of the famed Halong Bay. It’s not as crowded and it’s just as beautiful. That’ll be my next entry. Still much to catch up on! Thanks again for following! 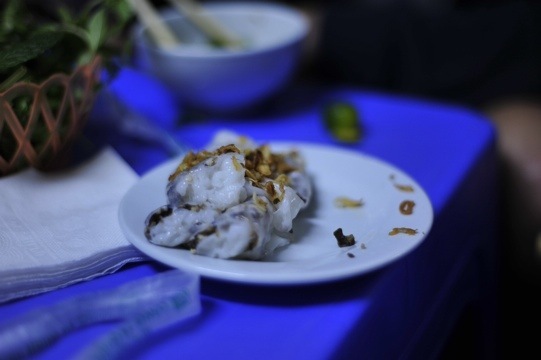 Thanks for your enjoyable street food tour with us and share your excellent experience here . Thanks for your kindness and I am looking to seeing your sharing experience on tripadvisor . Tell me your article name on tripadvisor if possible . © 2014 | VISUAL TAPESTRY IMAGES - ALL RIGHTS RESERVED.